In some cases you might not see the War2.ru server in the dropdown list of gateways after you select “Multi player game” and “Enhanced” at the main menu — this can happen if you’re using an original Warcraft II CD or installed the game from a pirated .iso file. The easiest way to fix this problem is to download & install our custom War2combat client which will rewrite the gateways to include War2.ru and War2.me. 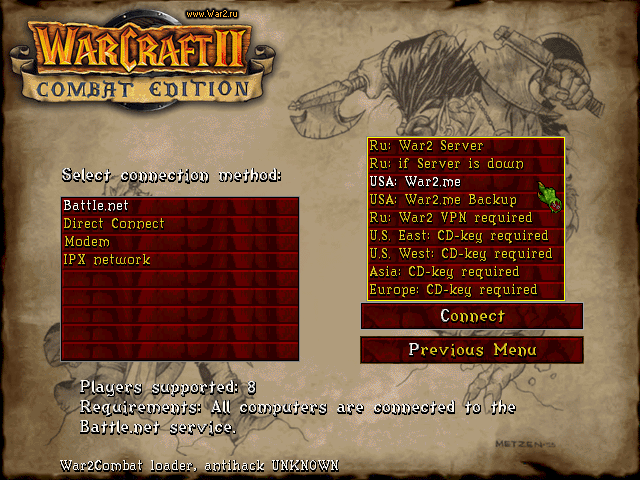 Another option is to download and run this registry file which will add our servers to your current copy of Warcraft II. If you prefer to add the servers manually then you can follow this tutorial to add them using the Gateway Editor app.